Mar 10, 2014; Surprise, AZ, USA; Texas Rangers pitcher Yu Darvish (11) in the dugout after his start against the Cincinnati Reds at Surprise Stadium. Bailey, , who signed to a six-year, $105 million contract this winter, gave up two runs on three hits, while striking out five and walking none. Reds: Bailey threw 39 strikes in 58 pitches. 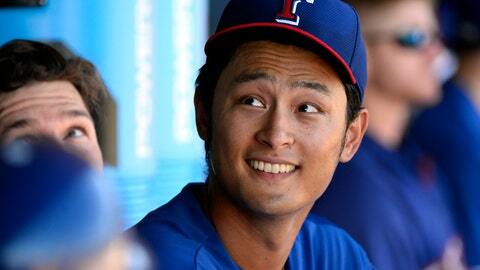 Rangers: Darvish averaged just more than 12 pitches an inning against the Reds. Rangers reserve second baseman Kensuke Tanaka broke three teeth when Brayan Pena’s helmet struck his face on a pickoff attempt in the seventh. "The runner and he got there at the same time," Washington said. "The ball was down and in a position that left his face vulnerable. And he ended up hitting the guy in the helmet. The runner was Big Head Pena. That’s a big helmet to run into. I don’t know until he came in. He just showed you how tough he is because he stayed in and had an at-bat and then we took him out so he could be taken to the dentist." Joakim Soria pitched around two singles and a balk in a scoreless seventh. He has pitched three scoreless innings in his first three appearances. "He’s doing what he usually do, command the baseball," Washington said. "The first two hitters he faced, every pitch was a strike." Reds: Left-hander David Holmberg (bruised right shin), who has appeared in only one game, is scheduled to throw Tuesday against minor leaguers. Rangers: Left-hander Matt Harrison (lower back tightness) will start a Tuesday B-game against the Royals.